Amy Atlas is queen of the dessert tables. She has transformed the cake table into a stunning piece of edible art and shares all the how tos in her new book. 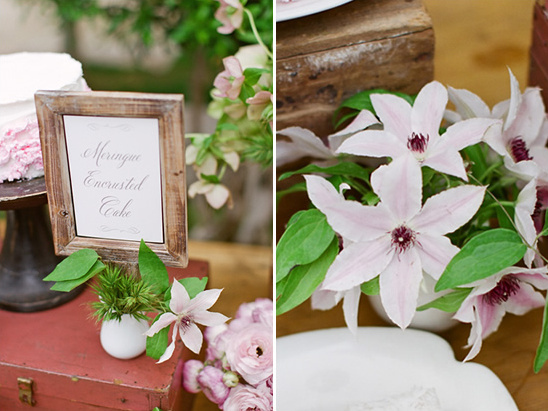 Filled with levels of tasty treats, fresh flowers and beautiful signs. All taking weeks to plan, prep and design. 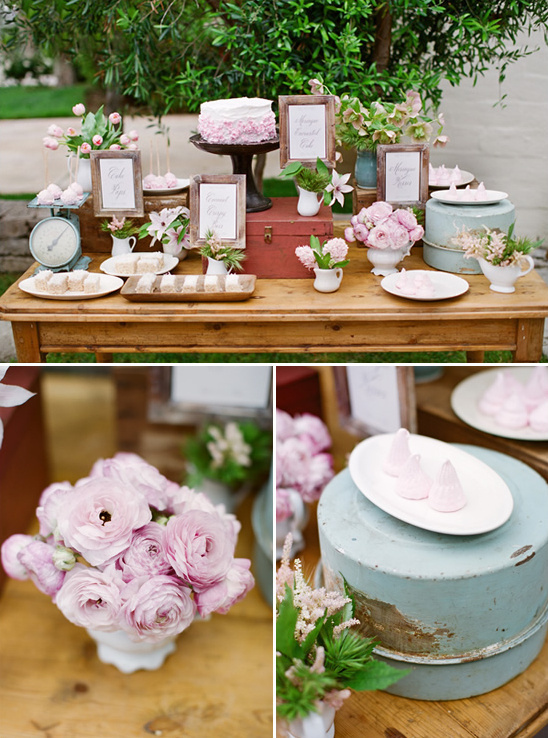 Matching the theme of the wedding and becoming a direct reflection of the bride and groom's sweet tooth. 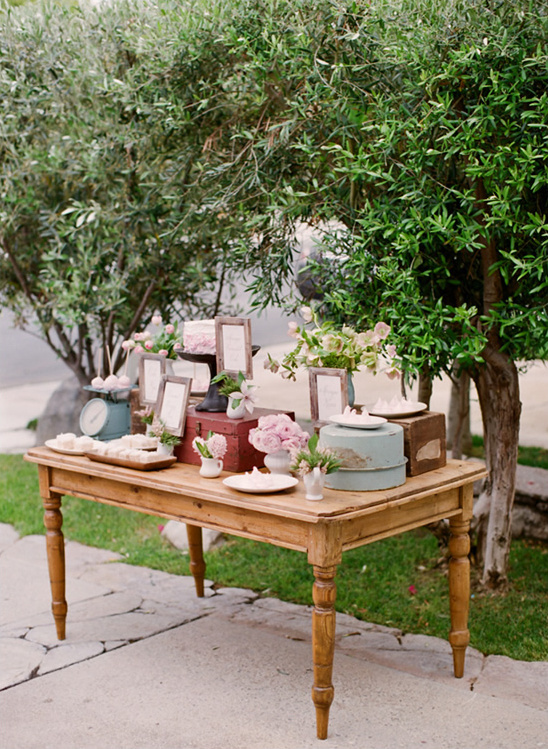 These days we are positive your guests are just waiting to see what delicious goodies will be at the desert table. 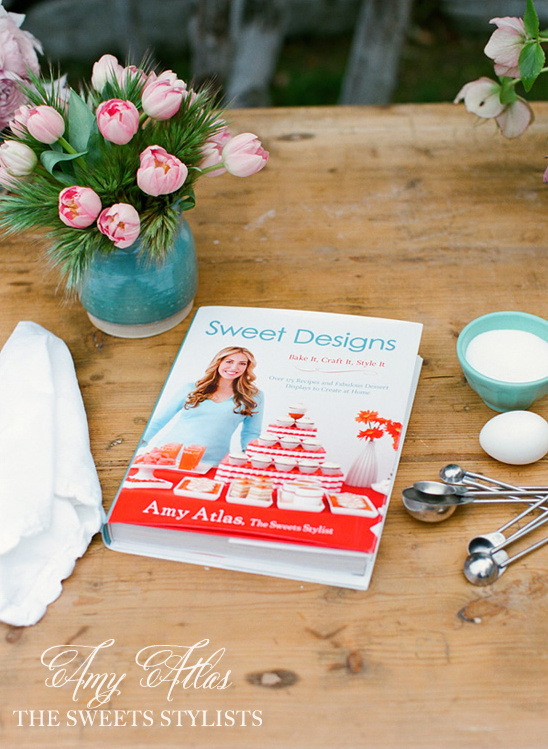 In honor of the dessert table and sweets in general, Amy Atlas has just launched a new book Sweet Designs. Overflowing with inspiration, easy recipes, dressed-up store-bought treats, and craft ideas to make dessert a fitting grand finale to any gathering. 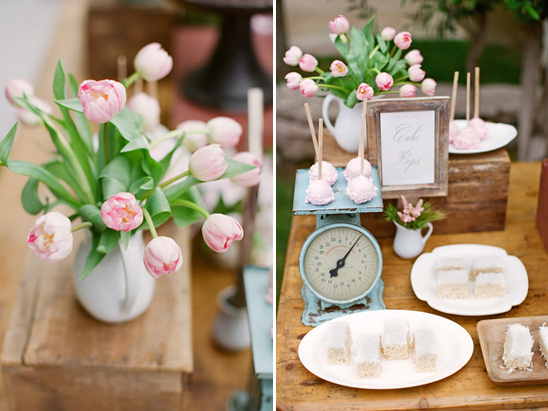 The perfect inspirational item for brides to be planning the sweetest day of their lives. We were so inspired by Amy's new book we decided to whip up a few of her recipes and design a dessert table of our own. Luckily for us we have our house culinary expert Caitlin to help us out. Captured ever so perfectly by Lane Dittoe Photgraphy. 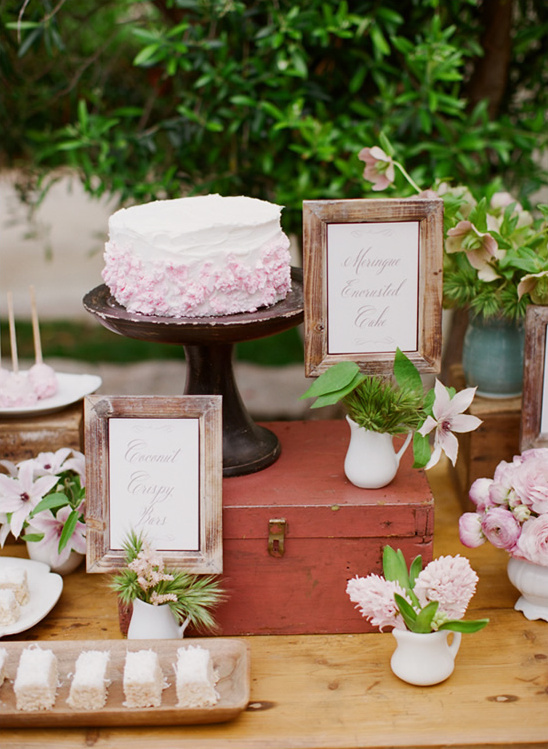 A dessert table looks especially pretty with fresh florals. 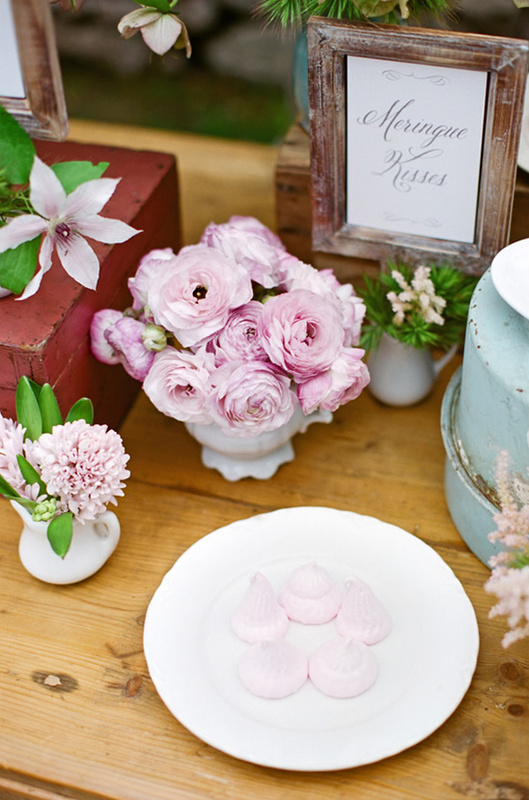 The lovely Nancy of Oak and the Owl paired a variety of pink spring blooms in delicate white vases. 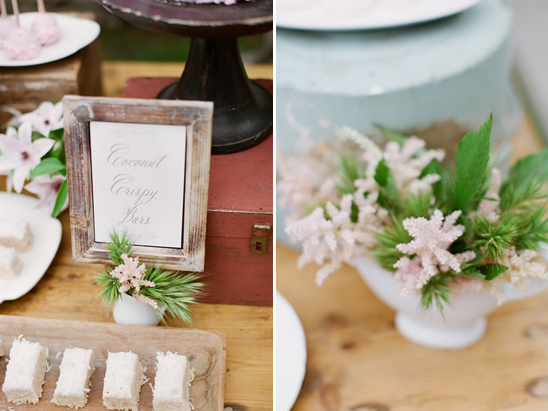 Our wonderful friend Jeni of Found Vintage Rentals provided all the pieces for our delicious shoot. Including her personal collection of Ironstone , an amazing two hundred year old French farm table, gorgeous vases and the oh-so-darling antique light blue scale. 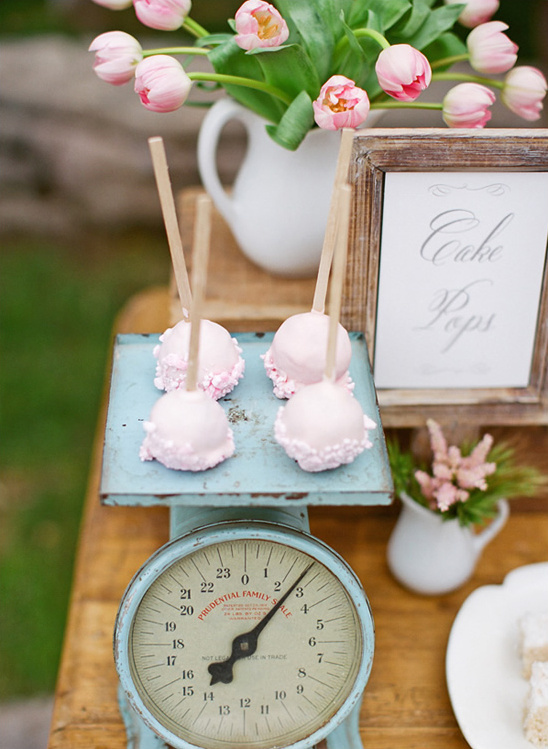 How cute does that look with the cake pops? Steal worth idea ... right? We were so inspired by Amy's meringue recipe that we created a little something extra. We are huge fans of meringue, it's so light and crispy and such a special treat. We created a meringue encrusted cake, using crushed meringue from the kissed we added it to our cake. Light and fluffy cake, creamy icing and crunchy meringue - delicious, don't you think? We sure do! You can find more dessert table inspiration and all the recipes seen in this inspirational in Sweet Designs by Amy Atals.